Father’s Day is coming up so I wanted to start doing some Father’s Day gift ideas. Modern day men are more into pampering themselves so I wanted to share my bath salt recipe. James loves taking bathes with bath salts. Bath salts can get expensive and you can easily make your own. Gifts are better homemade and any father would love receiving this gift. You can dress it up by using pretty containers. You could also make different colors and create a sand art look in the containers. Mix the Epsom salt and baking soda VERY well in a large bowl. Store the homemade bath salts in a glass jar with a good seal, to keep extra moisture out for as long as possible. 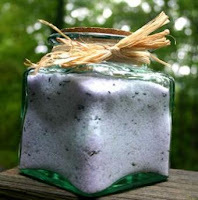 You can make your bath salt to your own liking and change the recipe each time for a little change. You can use essential oils to add a beautiful scent. Make sure that you do not use candle scents. It has to be safe for bath use. If you use different colored dyes to create a sand art effect make sure they all have the same scent though. You do not want to get a headache from all the smells. Mix ingredients and add food coloring and/or essentials oils just like in the first recipe. I did this for Christmas gifts this past year. It was really easy, and I think they were well liked. Hi I just stopped by to drop on your Entrecard and wanted to let you know that you have been added to Blog Angel’s All Above the Crease Drop List . I created the list because I was sick of wasting time trying to find people’s Ecards. You and everyone on the list has their Entrecards in an easy to find location. Stop by and check it out. You have a really great blog! Thanks so much for sharing your thoughts. Do you mind if I ask you something….I’m considering starting up a blog for profit and I was wondering if it’s worth the time and effort? Have you found it to be worth it? Thanks! Alicia.Ben@gmail.com is my email. I really appreciate any tips you have!